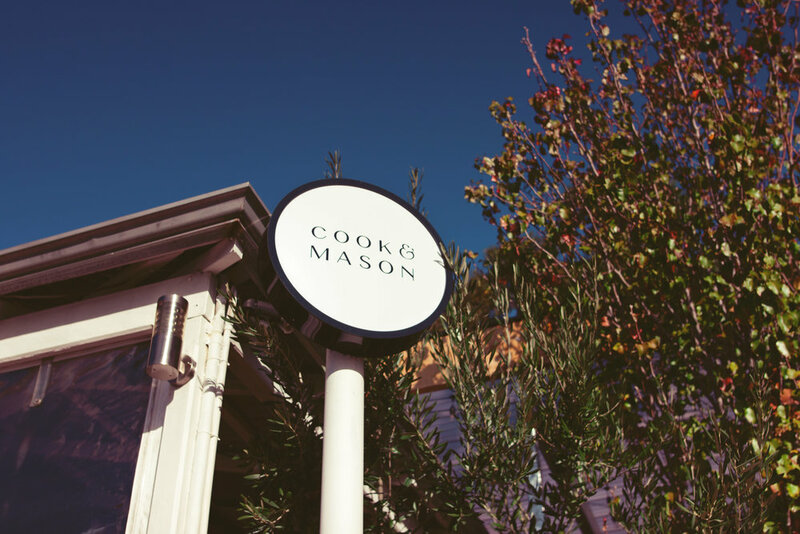 Located in East Fremantle, Cook & Mason is focused on high quality, seasonal and locally sourced produce. Owners chef Gord Kahle and Craig Houston opened Cook & Mason in October 2017. It is located within one of the oldest buildings on the historic George Street. Our menu is designed to share and will be changing often to make the most of the freshest, finest foods in season. Our ingredients are ethically, sustainably sourced from some of the best local farmers and growers. We have an extensive Australian wine list focused on minimal intervention wines and feature handcrafted cocktails, local beers and ciders, and you can always join us for a drink without a meal. Join us for dinner Tuesday to Saturday, or lunch Friday & Saturday, Or book out our gorgeous patio for a special event or long lunch on a Sunday. We can tailor a menu for any kind of event. call (08) 6161 9767 from 12pm Tuesday - Saturday. Lunch: Feel free to book any time from 11.30am Dinner: Bookings commence at 5.00pm / We do not accept bookings at 7.30pm, please select an earlier or later time. Thank you for your booking enquiry. Please ensure that you have supplied a phone number so we can contact you. We are unable to confirm bookings on Sunday & Monday, we’ll be in touch on Tuesday. For bookings of 8 people and more you will be required to go with the Chef's Set Menu. Please note that our menus change frequently due to seasonality and availability of local produce. All of our dishes are designed to be shared. Many of our dishes can be adjusted for vegetarian, vegan and gluten free diners. Join us for lunch, Friday from 12.00 and Saturday from 11.30am - 3pm. The $45 set lunch menu is available alongside our regular menu, and can be tailored to vegetarian, vegan, and gluten free diners. We are open for Dinner, Tuesday to Saturday from 5pm. Our chefs choice menu can be tailored to vegetarian, vegan, and gluten free diners. Our carefully selected beverages menu features some of the best wines being produced by the finest winemakers in Australia. We also showcase a range of locally produced beers, ciders, spirits & cocktails.